Last night, I was supposed to log off of Guild Wars 2 after completing my dailies and go read a book. That was my intention, I swear! But then I got to Lion’s Arch and someone made a comment about the necessary death of Logan Thackeray, one of the game’s hated NPCs, and we were off. Having read the book featuring Logan’s so-called heroism alongside his guild, Destiny’s Edge, I and a few others got into a half hour conversation about why he and Queen Jennah need to go and we discussed the rich lore behind Guild Wars 2 and its history from the original game. A few weeks ago, there was an in depth theoretical and mathematical discussion about why every bandit players have ever caught carries broken lock picks. All this occurred in mapchat. To be clear, mapchat is something I have skilfully avoided in any MMO I have ever played. I despise mapchat because it is where all the idiocy of the MMO player mentality comes out to play. There’s nothing like having your chat screen peppered with various sexual and sexuality insults, jokes about my mother and references to Chuck Norris. And if the game is not World of Warcraft, then mapchat is filled with comparisons to World of Warcraft. And Chuck Norris. I was amused that one of the first things you see in Tera’s brief introductory message is instructions on how to turn off the global chat. I made those adjustments right quick. And yet, I cannot live without mapchat in Guild Wars 2. This is one of the many things I have come to appreciate about this game. It is an aspect of the community environment ArenaNet has worked so hard to create and maintain. All events, save for instances, are open to everyone and, since there is no competing for mobs or loot, it is in the best interest of all players to work together for the greater good. Last night, a new event was introduced requiring players to locate hidden items on the map. Commanders, who are identified with special icons, were out marking the location of the items and letting everyone know. 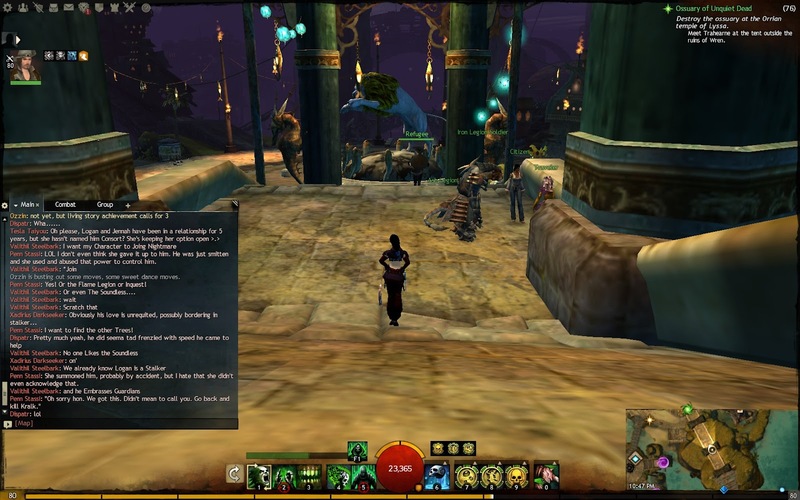 When mapchat isn’t filled with entertaining and mostly friendly chatter, people are helpfully passing on information about events and answering game-related questions. Of course there is still trolling. What would an online world be without trolls? But even they are of a kinder, gentler sort and most of the time are ignored or indulged for pure entertainment value. There is a valid complaint that the gaming world is saturated with MMOs now, each offering very little variation on the same old theme. In terms of technical mechanics, Guilds Wars 2 is no different. But this community business? That is different ball game and it’s something I would definitely welcome in future games.